These are great products that I found that make keeping your spaces organized a breeze. Tips & Products from Organize Me! This one is for all of you with oodles of accessories and no where to put them! Whether it be earrings, watches, scarves or hats, there is a better way to get it organized! You probably have a piece of jewelry (or two!) that you know you have, but don’t know where it went. That means it is probably an excellent time to get organized and find it. Trash broken accessories. If a pair is missing, set it aside for a week or two in case you find the other. The possibilities are endless for how you can organize your products. As always, the method greatly depends on personal preference. If you don’t like a certain method, don’t do it. You are more inclined to keep something organized if you like the method used! For bracelets & watches: Pegs for sure. You can get creative with this and use an old bottle, a paper towel rod and so much more! For necklaces: Hooks that hang separately are essential to avoid tangling! For the best collection of all these ideas and so many more, check out Organize Me’s! Pinterest page. When you are ready to sort through your tangled jewelry, contact Organize Me! Shoe Organizing from Organize Me! There are numerous ways to store the multiple pairs of shoes in your household. What you choose will depend greatly on your preference and what works for your home. Some of my favorite products are the ones that allow you to store the greatest amount of shoes without spending a great deal of money. For more tips & help on how to organize your shoes contact Organize Me! Also, visit my Pinterest to check out some more shoe organizing ideas. If you have tools, watering cans, bug spray, toys and other items laying around outside, this shelf will help! Once that warm weather hits, we all love to be outside. The lawn gets taken care of and we also get out and have fun! However, items left behind in the yard or stacked up outside the house can be an eyesore. When it will get used again soon, why not create a storage system right outside for it?! While there are hundreds of products out there to keep your outdoor space organized, most are unattractive. If you are looking for a product to leave outside all seasons, then an industrial looking product may be best. However, if you are prepared to clear off your shelf at the end of fall then this product is for you. It’s cute and functional. It may not be best for all seasons so bringing it inside once cold weather hits is a good choice. With excellent reviews and a decent price, this is one product we should all consider! Get outside, get stuff done and enjoy the weather. Keep your yard easily tidy when your done by utilizing the various shelves. The best part is that it has holes so water isn’t a problem and it easy collapses, too! Messy Car Solutions from Organize Me! If you are anything like me, you might feel like you live out of your car. Life gets busy and we end up with tons of stuff in our car. If you are fed up with the stuff in your car and need a change then this article is for you! This one is available from Staples (one of my favorite places!). It’s $55 and includes several different size and shaped pockets for various items. 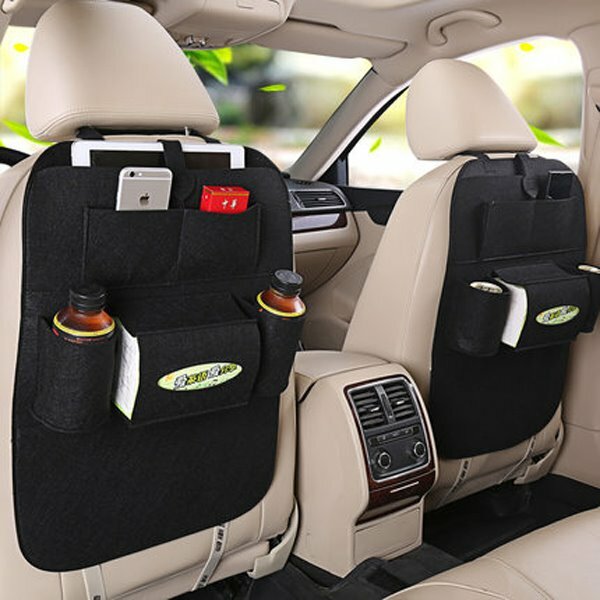 A product like this may be good for your front seat to keep things easily accessible, but not when you’re driving! It would also be excellent for kids in the backseat to keep their toys in order. The trunk, of course, would benefit from this as well. Instead of having things roll around back there, keep them contained. Here is a classic back of the seat organizer. This can be especially helpful for long drives or for everyday use if you spend a lot of time in your vehicle. This product can help to keep you safer while driving. Instead of tending to your kids or grandkids about whatever they may need, they can reach it themselves! You can stock this with books, tissues, snacks, chapstick or whatever else you need to keep them distracted while you drive. These are really affordable for approximately $15!! If you have a lot of activity in your vehicle, you may need something more heavy-duty. This product can store more and larger items. You may be taking your kids or grandkids to various athletic activities or other school events. An excellent idea for this product is extra changes of clothes. This product can strap into your hatchback or truck and be extremely useful! Depending on where you purchase it, the cost is approximately $20. Here are some final quick tips to keep your car organized. For help getting your vehicle back in order, contact Organize Me! Here is a review of some spring cleaning products that can help you. Some are pretty basic and some are extensive but they will help you get the job done. Combine all the products and your are sure to have a spotless home this Spring! Got a favorite product that you use to clean your home? Feel free to share it in the comments! For help tackling your spring cleaning clutter, contact Organize Me! If you have a small home or are just caught up with the small living trends, this article is for you! Use open shelving. If your kitchen is short on cupboards or if you just want to make it seem more spacious, opt for open shelving. Office Spaces. Turn your spare closet into so much more than a storage compartment. Create a tidy home office that you can shut away when it’s not in use. Books. Rather than attempting to squeeze even more cumbersome bookshelves into your petite home, choose a book tower. Towers allow you to stack your books and take advantage of vertical space. Pantry Space. If your spare closet is near the kitchen, it could serve as a pantry and a great place to store excess kitchen supplies. Loft Beds & Bunk Beds! For older children and even adults, a loft bed is a great way to leave floor space open. It takes advantage of otherwise unused space and makes it possible to add a desk or a seating area in a small room that would have been otherwise overwhelmed by a large bed. Bike Storage Needed? If you’re a biker living in an apartment, you probably know how difficult it is to keep your prized possession safe from harm as well as out of the way. Check out this nifty bike shelf from Knife & Saw. Use convertible furniture. Luckily, convertible furniture makes it easy to switch from office to bedroom to dining area with just a few simple moves. Have gardening tools that have turned into a messy disaster? This is an awesome product for you! Maybe part of the reason your garage or shed seems so messy is because of the tools everywhere. It can be difficult for sure to keep different tools standing up the same. Shovels don’t stand up the same as brooms. Those long handles end up laying everywhere and creating a mess. This is a great product from Rubbermaid and is fairly inexpensive. This awesome holder has also received great reviews and holds many tools! Get your garage or shed organized this Spring! You’ll probably save yourself an injury too, since you won’t be tripping on your tools! Check out some great ways to make the most of the space you have. Some of these tips are great! It’s hard to get work done when your home office is a mess. Most of us just don’t know where to start or what works best to get organized. There are thousands of ideas out there in the world. Here are some quick tips from Canadian Home Trends on how to get your office organized. Click the link below for the full article and some impactful pictures. Got anymore great organizing tips for home offices? Leave your in the comments below! Introducing a stylish-yet-practical way to organize your belongings. The Baggie All is the ultimate organization system for loose items; it works great as a purse organizer, travel toiletry bag and gym bag organizer. A multitude of stylish colors allow you to arrange similar items together so that you can quickly find gym toiletries versus phone accessories. Three zippered pockets add three-times the organization, keeping your office items separate from your personal products. Now, aren’t you just SO organized!